I have spent a great deal of time reading and researching this issue. Without a doubt it is one of the issues that causes caregivers great concern when their Feathered Angel suddenly begins to pluck or even mutilate. These Angels are sometimes very well cared for, the best AV care, proper diets, sunshine, regular bathing and suddenly they begin to pluck for no apparent reason. There can be many reasons that a parrot begins to pluck or mutilate. On occasions the reason is identified quickly and resolved. Unfortunately though this is not the case many times. Even if the initial reason is discovered and corrected, the bird may continue to pluck out of boredom, habit or for attention. Parrots are also very empathic and they pick up on their caregivers anxiety over the plucking and can actually make the situation worse. The very first course of action must be a complete AV checkup to rule out any sort of illness. Once this is done and all physical reasons are ruled out then one must look at the environmental and psychological possibilities. There can be many medical reasons for plucking to begin. Here is a list of just some of the medical examples for why plucking might start. It is not all-inclusive and only your AV can make the tests necessary to rule out all possible medical reasons. Here is a list of some of the non medical reasons that plucking may arise from. Again this list is not all-inclusive and only should be used as an example. The list of reasons could be endless. Sudden change in a parrots life that is use to a rigid routine can be very devastating on them emotionally. I feel that it is really important for caregivers to make sure that routines are varied a little at a time in order to allow your bird to accept changes when they do occur. Make subtle changes on a regular basis and you will have a much happier more well-adjusted Parrot. Provide plenty of toys which can be torn up and destroyed, parrots find great satisfaction in tearing things up and need to do this. You can make toys using cotton rope, untreated pine wood. Rotate toys every couple of weeks, give them variety or they will become bored. It is vital to keep your birds mentally stimulated. 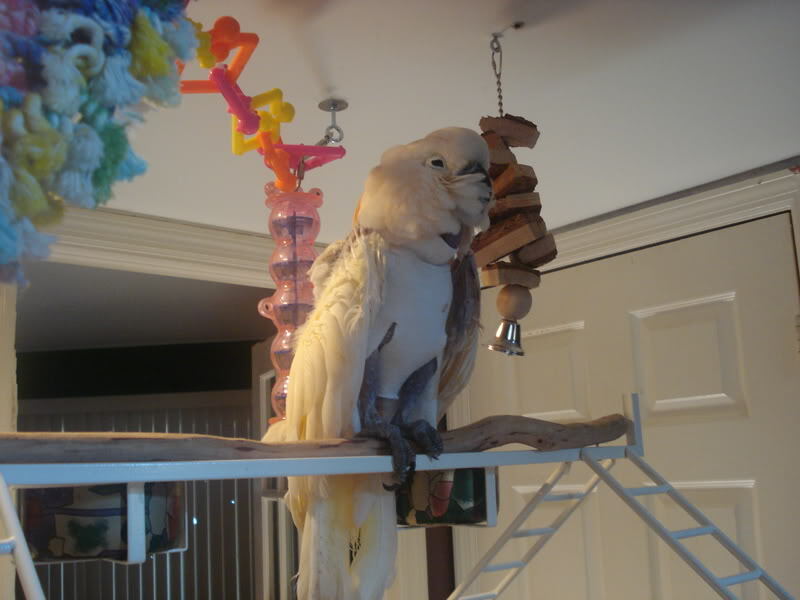 If your bird is afraid of new toys, lay or hang them within their view for a couple of days. Play with them yourself and make happy sounds, most parrots cannot resist playing with something we have and like. Try hanging them on the outside of their cages where they can get a better look and play with them through the safety of the cage walls. Foraging is also another great way to occupy your bird’s time by making it work to find food inside of a cardboard box or special toy made to hide treats. Birds in the wild spend hours daily foraging and looking for food, this is an essential part of their life and we should include it in captivity for them as well. I cannot stress enough the importance for physical activity daily. Parrots need out of cage time everyday and for as many hours as possible. In the wild they spend hours flying miles daily for food, shelter and other things. Their bodies require a great deal of physical exercise in order to maintain their health. In captivity the need to hunt for food is eliminated however this does not eliminate the need to exercise, in fact it only increases the need. Play and interact with your parrot, dance, sing, play fetch. The possibilities are endless and the rewards are priceless. Make sure your parrot is part of the family and is spending its waking hours with the family. Dont keep them in back rooms, these are flock creatures and they need to be with their flocks and you ARE their flock! You do want to avoid placing a nervous bird where there might be too much commotion. Some parrots prefer a more secure place in a corner where they can’t be approached from all sides. Some parrots enjoy looking out a window, while others might be constantly frightened by movement from outside. Know your bird and watch their reactions. Find a place in your home where they can be part of the family and still feel safe and secure when needed. Proper sleep for parrots is so vital for their mental and physical well-being. Parrots need 10 to 12 hours of quiet sleep each night. this means they need a dark, quiet room in which they can get complete rest. You can either move their cage into another room or provide a sleeping cage in another room. Parrots need to bathe as often as possible. This can be in a dish, using a spay bottle or in the shower with you. It needs to be introduced slowly and never forced however. You want your parrot to enjoy bathing and not feel like it is being punished. Parrots who do not bathe regularly can become itchy and their skin dry and flaky which can cause them to pluck. Parrots need to be a bird and not have too much attention lavished on them, especially when they are young. They need to be able to play alone and entertain themselves, so that when they are alone at times it does not cause them further stress. Focus on teaching your parrot to play and do tricks. Avoid sitting with your parrot and petting and snuggling. This can lead to even more issues which may stimulate breeding hormones and cause frustration. As a caregiver it is important to ignore the feather plucking behavior. Parrots will take any type of attention they can get, even if it is negative. If you are constantly trying to distract them when they are plucking, it may actually lead them to pluck further to gain your attention. As difficult as it may be you MUST ignore the plucking behavior. Plucking and Mutilation is so difficult on a caregiver who loves their Feathered Angels. Even after all medical issues are ruled out or cured, and changes are made in the parrots lifestyle to ease plucking behavior it can still continue. Sometimes once the behavior starts, it becomes an unbreakable habit. Captivity on Parrots is just harder on some and they may never adapt. All one can do at this point is to try and keep your beloved Parrot as happy and healthy as possible, and love love love those little nakkie babies. They are precious no matter if they have feathers or not. This is Noelle and she is a plucker and mutilator. She had a very rough start in life and one that led her to self-destruction. She was rescued by Janet Howell, and has now received the very best medical care possible and unconditional love. While her behavior will most likely never end completely, Janet and her AV continue to strive and make life for Noelle as happy and comfortable as possible. Noelle now knows love and has a wonderful bond with Janet. I encourage everyone to read her journey. I have the opportunity to rescue some Macaws that have issues with feathers. With proper nutrican and care can they grow back?